Assembled black boxes and other parts. For a totally professional installation I tried finding the original connectors installed in the car, but Mazda only has the complete wiring harness and headlight actuators. 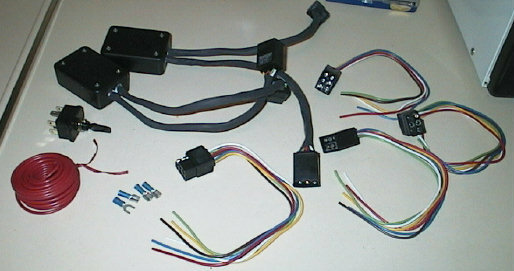 An on-line junk-yard wanted $100 for the connectors. The 6 Pole Trailer Wiring Harnesses can be found at Wal-Mart or local auto parts stores. (UPC 79976-47995; see picture at right.) They are manufactured by Hopkins Manufacturing Company, Emporia, Kansas (316) 342-7320, Part #47995. An identical harness (UPC 46494-08026) is distributed by CALTERM, El Cajon, CA and also available at auto parts stores. Just about any 6 conductor polarized connector will work, but these listed have the advantages of color coded leads, a snug, water tight/resistant fit, and easy availability at a reasonable cost. This fit is so snug, however, I recommend connecting and disconnecting them several times before installing them into the tight confines of the car. It helps having one side in a vice to do this. 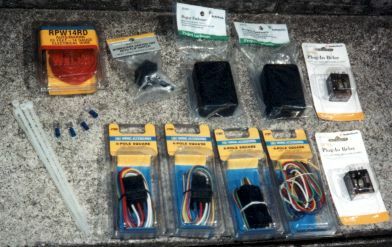 I originally tried using Radio Shack 6 position polarized connectors (274-226 & 274-236) but the headache of working in cramped quarters with no color coding and the additional soldering exceeded my desire. These connectors can be used, however I don't think it would be possible to make a "neat" unit. The case listed (1"x2"x3") requires a little modifying for the relay to fit properly, and it's still a snug fit. If you're not experienced at soldering or plan to use crimp on connectors, you may want to try the 1"x2"x4" case RS P/N 270-1802. Listed at $2.29 the added cost to the project is only $.60, but I opted for the smaller case to save space. I originally intended to mount the cases with a single 6-32 machine screw epoxied on the inside of the case to absolutely prevent the case from coming loose. After a detailed inspection I decided too much disassembly of the car was required, and I was still unable to reach the underside of the chassis to install the nut on the screw. I decided to attach the case to the chassis with foam tape, with Permatex Super Weatherstrip Adhesive to aid in stickiness. If you mount the case with screw(s) I still recommend cushioning it with foam tape underneath. Female Quick Disconnects 3 $1.49 Radio Shack P/N 64-3046. Price is for a package of 5. Insulated Spade Tongues 1 $1.49 Radio Shack P/N 64-3035. Price is for a package of 10. Hook-up Wire 20' At least 16-14 gauge. Originally I looked for a rocker style switch, but the "momentary" feature is only available as a special order from Radio Shack $7.99 (RSU11336567.) I may try this switch in the future, it should fit in the switch knockouts near the cluster dimmer knob. The flip switch listed above doesn't fit in these knockouts and will require careful placement to prevent accidental operation. On the other hand, having the large switch located on the right side of the steering column makes for easier access (my left hand rarely leaves the wheel.) I finally decided on a single pole, double throw (SPDT) center off rocker switch obtained a local electronics parts store. It doesn't have the momentary feature, so I must manually return it to the center position. Virtually any SPDT or DPDT switch with a center off position will work. Tie Wraps Get a package at Wal-Mart. Electrical Tape Get at Wal-Mart. Shrink Tubing For quality work. Solder If you follow my advice. Soldering can be avoided by using crimp style connectors but I've only had luck with them when the wire ends were tinned with solder anyway. See the section on soldering. Shrink tubing will make for a more professional installation and should be available at almost any electrical parts store. Two sizes will be required. One large enough to cover individually spliced wires, and another large enough to cover all 5 wires of the cable assemblies.